Experience Africa’s enormous skies and wild remote landscapes on a journey through some of the continent’s most striking scenery. Encounter deep canyons and towering dunes, diverse wildlife and fascinating tribal culture on this overland safari tour through Namibia and the Cape, mixed with a host of adrenaline activities along the way. Leaving Windhoek we travel north to Etosha National Park, a reserve surrounding a giant salt pan. We track game for two days in this vast arid region and camp beside a floodlit waterhole, on the lookout for night time wildlife. 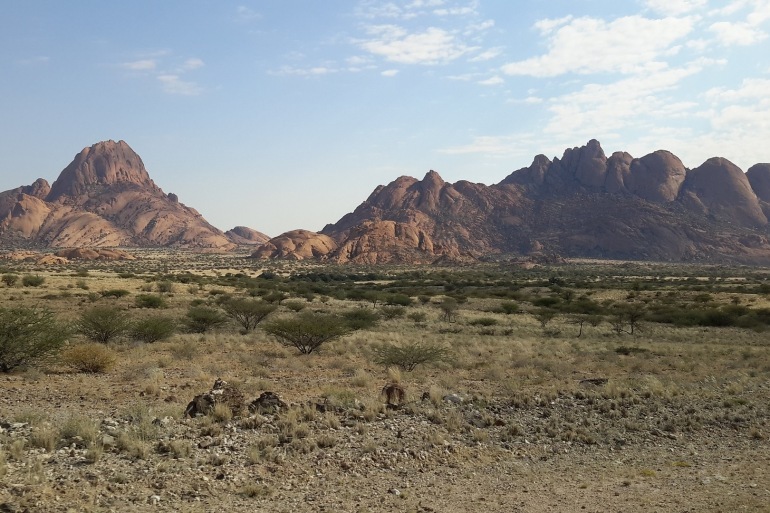 From Etosha we travel on tothe mighty Spitzkoppe with its rocky outcrops and ancient bushman paintings, and set up camp amongst the idyllic scenery. From Spitzkoppe we head south to the coastal town of Swakopmund where we can relax or enjoy optional activities such as quad-biking and sand-boarding! We continue south to Solitaire then to the Namib Naukluft Park, the world’s oldest desert. Clamber to the top of a dune for a dramatic view over the vast red sands at dawn and enjoy a walk through the dunes. Leaving the park, we head south through the arid lands to Bethanie and our camp for the night. Further south we visit another natural wonder of Africa - Fish River Canyon, the second-largest canyon in the world. Crossing the border into South Africa we camp on the banks of the Gariep (Orange) River and enjoy a relaxing afternoon. The tour ends in the cosmopolitan city of Cape Town, one of the world’s most attractive cities.